The original hand drawn crest. 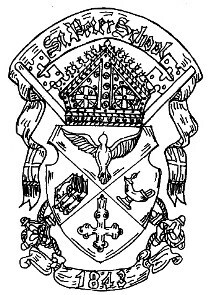 The crest of St. Peter Catholic School possesses deep meaning for those who havebeen members of the school’s faith community throughout the years as well as those who are present members of the St. Peter Catholic School family. The meaning and symbolism of the various components of the crest have touched the hearts of many and will continue to do so for generations to come. At the top of the crest are pictured the “Keys of St. Peter” and the episcopal mitre. Keys symbolize power and authority. The “Keys of St. Peter” honor the patron saint of our school. Our Lord and Savior, Jesus Christ, by employing this symbol clearly designed to signify His intention to confer on St. Peter the supreme authority over His Church. The life and witness of St. Peter provides us with a strong foundation as a school community. Jesus said to St. Peter: "Blessed are you, Simon son of Jonah. For flesh and blood has not revealed this to you, but my heavenly Father. And so I say to you, you are Peter, and upon this rock I will build my Church, and the gates of hell shall not prevail against it. I will give you the keys to the kingdom of heaven. Whatever you bind on earth shall be bound in heaven; and whatever you loose on earth shall be loosed in heaven" (Matthew 16:17-19). 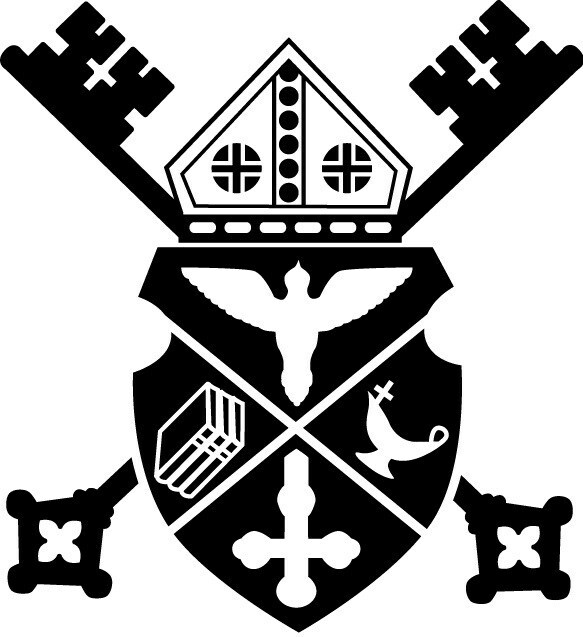 The mitre is a symbol of the office of the bishop. It symbolizes our obedience to Christ and to His representatives in both the Universal Church and the particular Church in and of New Orleans. With Christian obedience, St. Peter Catholic School shall associate itself with what is expressed by the holy shepherds as authentic doctors and teachers of the Faith or established by them as rulers of the Church. In carrying out the mission of Catholic education, which is committed to us in the name of the Church, St. Peter Catholic School shall preserve the Deposit of Faith in its entirety, hand it on faithfully, and make it shine forth. In the upper quadrant is pictured a dove. The dove symbolizes purity, innocence, and peace and is used to represent the Holy Spirit. At St. Peter Catholic School, we are guided each day by the movement of the Holy Spirit in order to build up the Body of Christ, which is the Church. We are a family of faith alive in the Holy Spirit, and we are motivated to cultivate the seven gifts of the Holy Spirit as we progress in the call to holiness. In the right quadrant is pictured a lamp. In the Old Testament, a lamp was filled with the purest olive oil and would be used to burn perpetually in front of the Tabernacle. It is a sign of honor and adoration, reminding the faithful of the presence of God. At St. Peter Catholic School we are aware of God’s sacred presence in each child. Jesus Christ is the light of the world, the light of the cosmic world, and the light of our inner world. He is the light that the darkness can never extinguish. His Word is a lamp to our path. At St. Peter Catholic School we recognize we need the light of Christ to bring us to the Blessed Kingdom. In the bottom quadrant is pictured the sign of the cross – the most well-known and the most loved of the Christian symbols. A simple cross is a sign of salvation and hope, a reminder of the jewel of our Christian faith. At St. Peter Catholic School, we walk the way of the Cross each school day out of deep self-sacrificial love for God and for the Church. "We adore you O Christ and we bless you, because by your Holy Cross you have redeemed the world!" In the left quadrant is pictured a collection of books. The books symbolize the commitment of St. Peter Catholic School in educating the whole person – body, mind and spirit. We understand that to be fully human, to be fully alive, excellence in mind must be matched by excellence in soul, conscience, character, and personal virtue. The ribbon surrounding the crest is a reminder that in all we do, we must be in union with the Church Parish and our pastors, and we must honor the tradition of Catholic education that has been passed down to us by the Church. In doing so, we honor St. Peter, as well as give glory to Jesus Christ, whom he loved and glorified in his work as an apostle and martyr. St. Peter Catholic Church was founded in 1843. We continue to live under the motto: Christo et Ecclesiae: For Christ and for the Church.